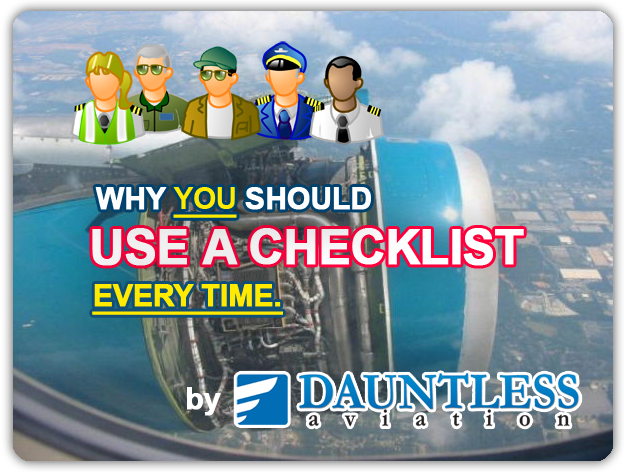 The checklist at left attempts to serve as a reminder as to why conscientious use of checklists is a must--even (or perhaps especially) when the pilot has thousands of hours in type and many checklist items seem innocuous. Click on underlined checklist items to read NTSB reports of accidents or incidents caused due partially or in full to pilot omission of that checklist item. Admittedly, some of the entries are a bit of a stretch--it's hard to imagine somebody bending metal because they didn't check the Hobbs meter before takeoff (outside of the prolonged case where overhauls are not performed far after the recommended time). On the other hand, other entries (read: FUEL QUANTITY-- VISUALLY EXAMINE) have literally hundreds upon hundreds of examples in the NTSB database. Some of the reports linked to resulted in fatalities. Many resulted in serious injury, and most resulted in bent metal leading to serious expense and possible embarrassment for those involved. It is not our wish to make light of the gravity of these accidents, but rather to keep their memory strong so that such things will not happen in the future. In some strange sense, we should all be thankful to those who have paved this unfortunate path before us, in that we have further example of what not to do. The checklist presented, of course, is for a typical nonexistent aircraft, with a few items omitted and a few concessions to allow the emphasis of the safety points we are hoping to make. "The accident airplane was found in the Mississippi River. The pilot was found fatally injured. Automated Flight Service Station briefed N5747U's pilot six times and that pilot was told in each briefing that a visual flight rules flight was not recommended." VFR into IMC constitutes the single largest class of fatal accidents for General Aviation. Chances are that when you get into trouble, the warning signs would not have been this obvious. Constant vigilance and prudence must always be maintained. The stakes are too high not to. "The pilot's inadequate preflight preparation, which resulted in fuel exhaustion, and subsequent loss of engine power during cruise flight." "The pilot's inadequate in-flight planning/decision which resulted in fuel exhaustion. A contributing factor in the accident was the pilot's inadequate preflight planning/preparation to ensure an adequate fuel supply was available for the intended flight." "The pilot's inadequate preflight planning which led to fuel exhaustion and subsequent loss of engine power." "A loss of engine power due to fuel exhaustion during approach, inadequate preflight planning/preparation by the certified flight instructor (CFI)." "The pilot's inadequate preflight inspection, which failed to determine the fuel supply in each fuel tank, and his mismanagement of the fuel supply, which resulted in fuel starvation." "A loss of engine power due to the pilot's inadequate preflight planning which resulted in fuel exhaustion." "The pilot's inadequate preflight planning and his failure to verify fuel consumption during flight that resulted in fuel exhaustion and subsequent collision with obstacles and the ground." "The pilot's departure with insufficient fuel for the planned flight, and his improper in-flight fuel management, which resulted in a total loss of power in both engines due to fuel starvation." "The pilot's inadequate preflight planning and failure to verify the amount of fuel onboard the airplane prior to departure, which resulted in loss of engine power due to fuel exhaustion." "The pilot's inadequate preflight preparation and failure to verify the fuel supply, which resulted in fuel exhaustion and subsequent loss of engine power." "The pilots improper preflight planning and preparation which resulted in a loss of engine power due to fuel exhaustion." "The pilot's failure to refuel, resulting in fuel exhaustion and a subsequent loss of engine power." "The pilot's inadequate preflight and mismanagement of the fuel supply, which resulted in fuel exhaustion." "The pilot's inadequate preflight planning of fuel required for the flight that resulted in fuel exhaustion and the subsequent loss of engine power." "A total loss of engine power due to fuel exhaustion as a result of the pilot's inadequate preflight fuel planning." "A total loss of engine power during a go-around due to fuel exhaustion as a result of the pilot's inadequate preflight planning." "The inadequate preflight inspection by both pilots, resulting in a loss of engine power due to fuel exhaustion." "A total loss of engine power due to fuel exhaustion as a result of the pilot�s inadequate preflight planning." "Improper planning/decision by the pilot, which resulted in fuel exhaustion due to an inadequate supply of fuel." "A loss of engine power during approach due to fuel exhaustion as a result of the pilot's fuel mismanagement." "A total loss of engine power due to fuel exhaustion as a result of the pilot�s inadequate preflight fuel planning." ... and on and on and on and on and on. The message we see over and over and over and over and over and over again so often that it would be funny were it not so sad is that aircraft run out of fuel. Some pilots didn't even get as far as the end of the runway before they ran out of fuel. Almost all of these (and there are MANY) 'out of fuel' incidents and accidents could have been prevented with better preflight planning and inspection. The takeaway is this - maybe you're in a rush. 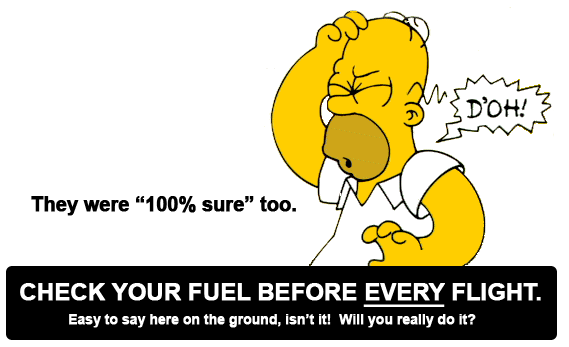 But always check the fuel. This is so very, very important. A close second to the above were the number of fuel contamination related engine failures due do water and debris in the fuel. This is also eminently avoidable with sufficient preflight inspection. And then, there are the 'funny' and 'stupid' ones (to use some "to the point" terms). We're not going to get into them too deeply here, but suffice it to say that if you choose a few well-chosen keywords in the NTSB search engine ("cocaine", "girlfriend", and so on) Use your imagination. "post-accident examination of the airplane revealed that the left fuel tank was full of fuel and the right fuel tank was empty"